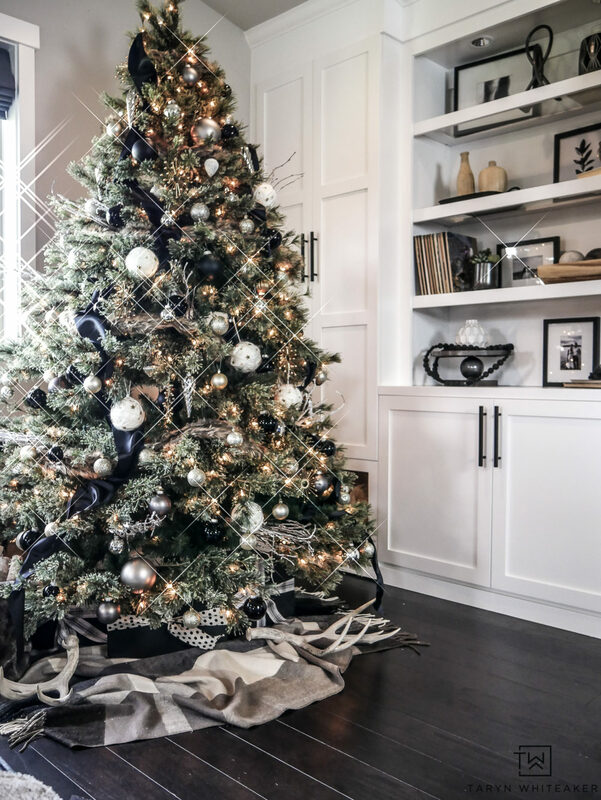 I’m so excited about today’s post because it’s allllll about Christmas Trees! I feel like I am now completely in Christmas mode now that we officially have one tree up and fully decorated! A few weeks ago I revealed our big master bedroom renovation project that includes our custom built-ins and fireplace. I couldn’t wait to get a Christmas tree up here this year to make it feel extra cozy! 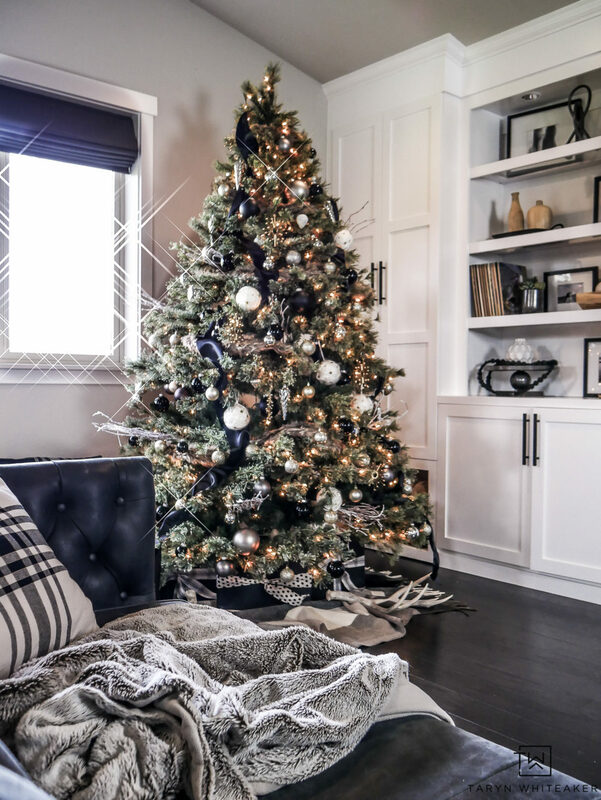 I wanted my Christmas tree to match the style of this room, so I went with a Rustic Modern Christmas Tree filled with black and gold ornaments with rustic touches. 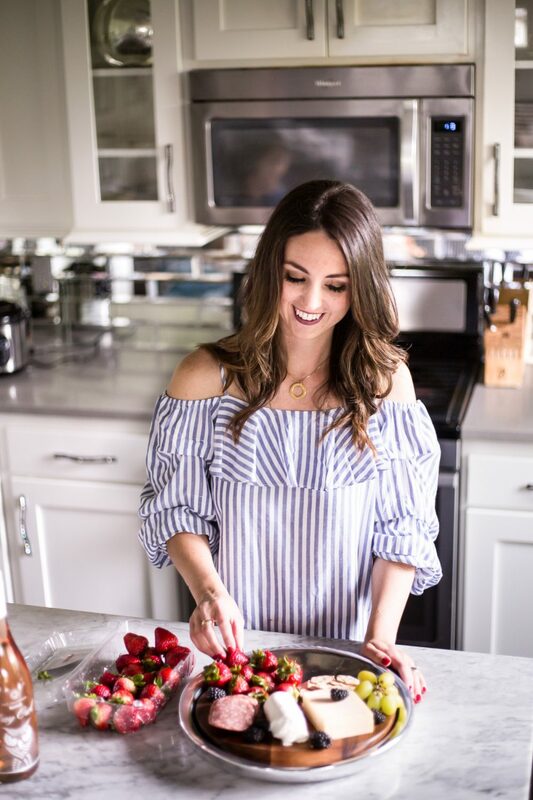 Today’s post is also even more exciting because I’m partnering with several other bloggers who are all sharing their own personal style and incorporating it into a Christmas Tree design! If you are visiting from Persia Lou , welcome! 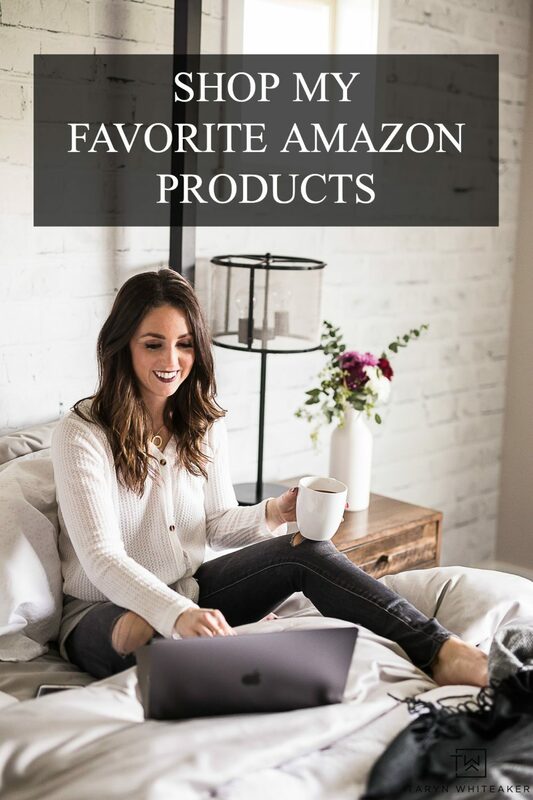 Head to the bottom of the post to see the full list. Here is a glimpse into our bedroom all decorated for Christmas! Well, at least this corner is. I love how the tree blends so nicely with the builtins and the stacked logs. 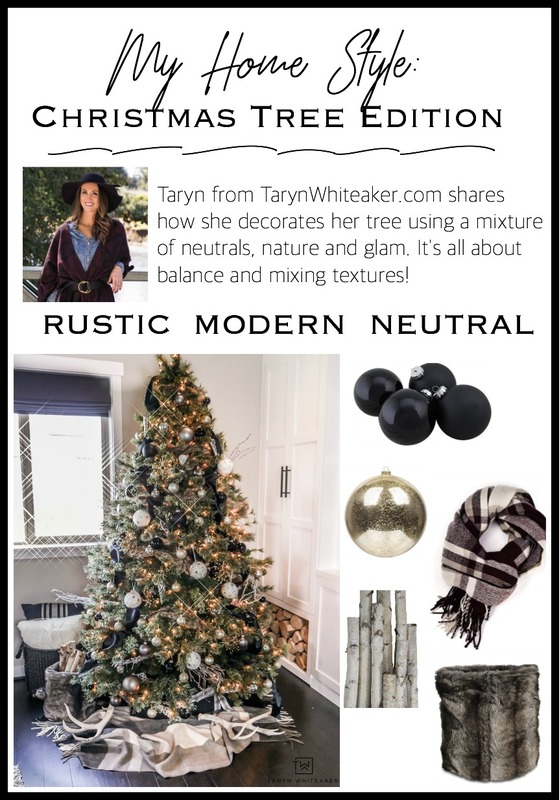 When I get asked what my personal style is, I automatically say “Rustic Modern”. Over the years as my style has evolved I have come to realize that this describes my style so well. In every design I do, I always mix black, white and natural tones with clean modern lines, and a little bit of chic. To me, it’s all about finding the balance of classic and modern and a variety of textures. And this exactly how I chose to decorate this space in our bedroom! 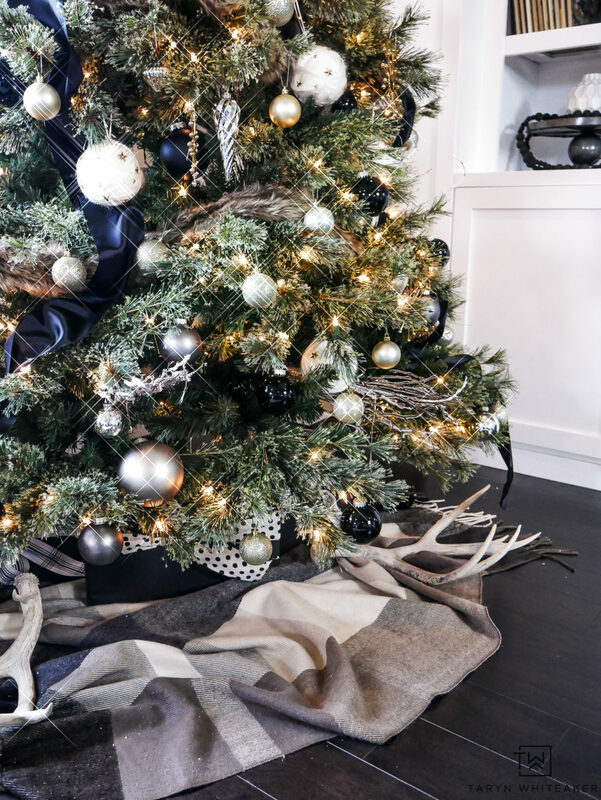 This tree is all about adding layers and a variety to different elements to create a full yet chic tree. The tree itself had a subtle flocking to it which helped add texture from the start. The next two elements I added were faux fur garland and white flocked branches for more texture. Next up, ornaments! I used a mixture of black matte and black glossy balls, along with gold and cream knit yarns balls. 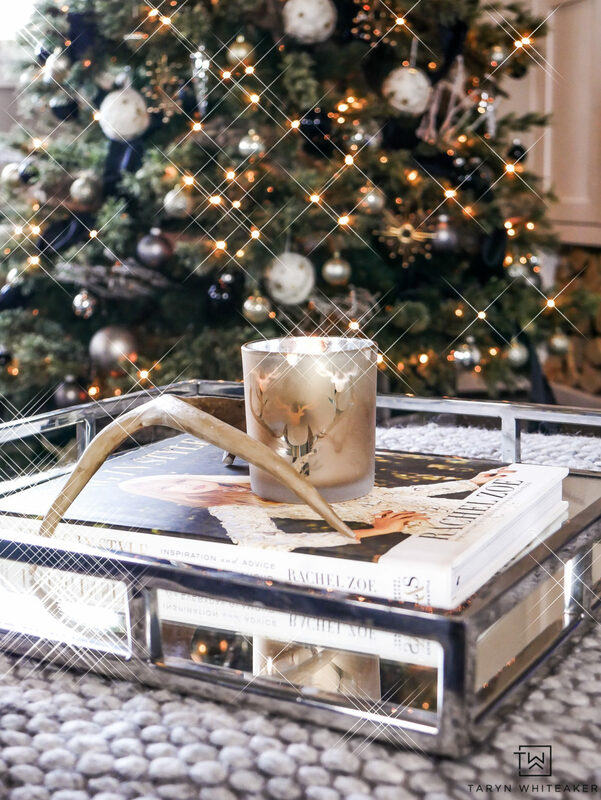 I also incorporated a few gold modern stars and vintage pieces. 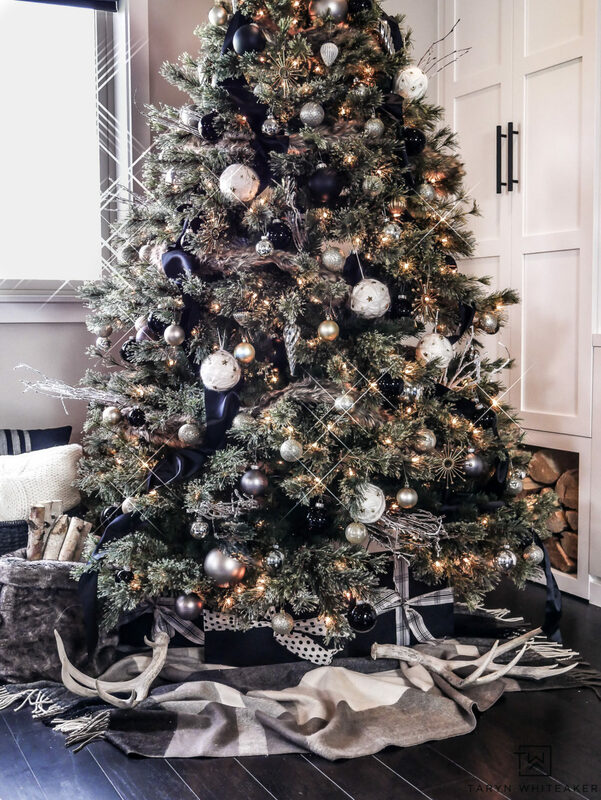 I ended the tree by draping black satin ribbon cascading down. Those rustic elements are what really bring this look together. 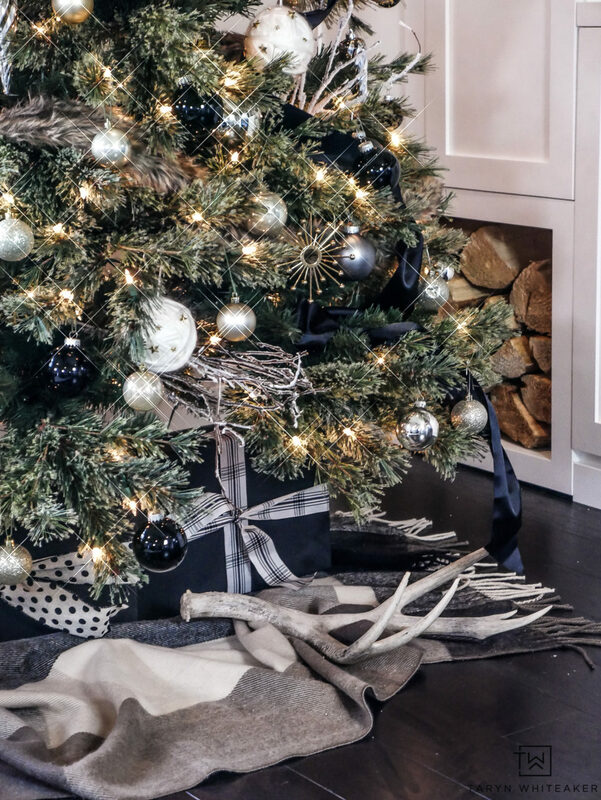 The neutral tartan blanket, antlers and fur basket filled with birch wood are all you need. Sitting on this couch at night watching TV and watching those lights sparkle is one of the highlights of this season! Every little things really feels so magical with the lights twinkling. 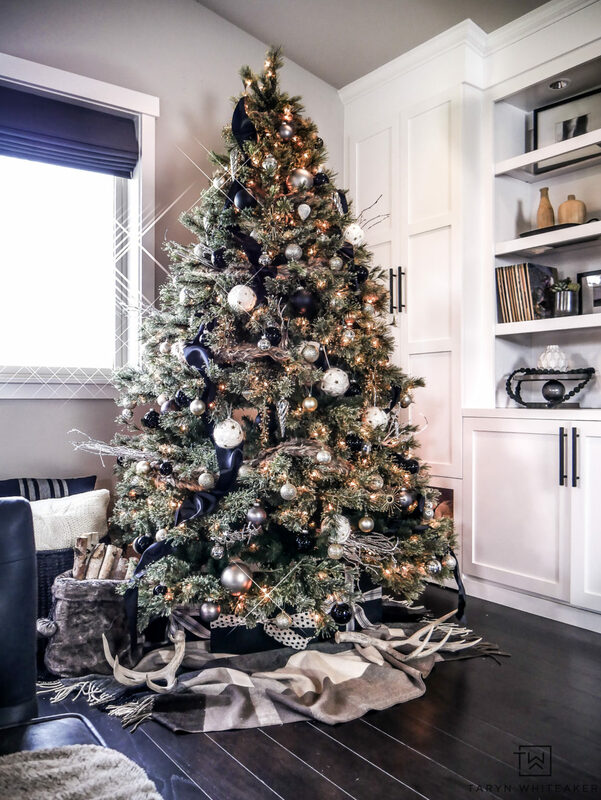 Now hop on over to House Homemade tomorrow to see her beautiful tree and scroll down for more. Where did you find antlers? That’s a great idea! As always, you nailed it! It looks amazing and fits perfectly in your new, gorgeous bedroom! I love it! OMGosh!!! Your tree is gorgeous!!!!!! Fits your room decor perfectly!! Where did you get the yarn star ornaments? Thank you so so much! I got those at Michaels last year. So pretty! I love that faux fur garland! Your bedroom corner looks beautiful! 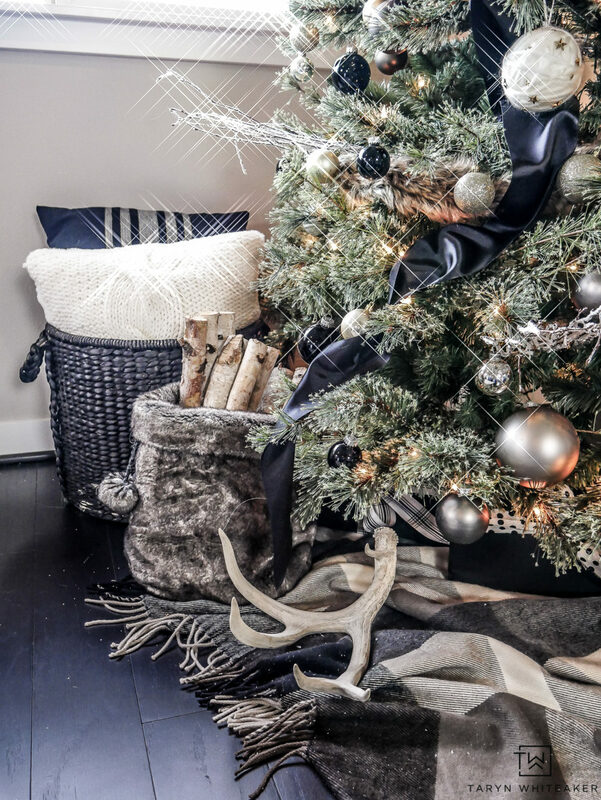 Love the neutral colors this year and the blanket tree skirt. Very pretty! Wow! It’s glam and gorgeous! I always want to try black but never do. Now I really want to! 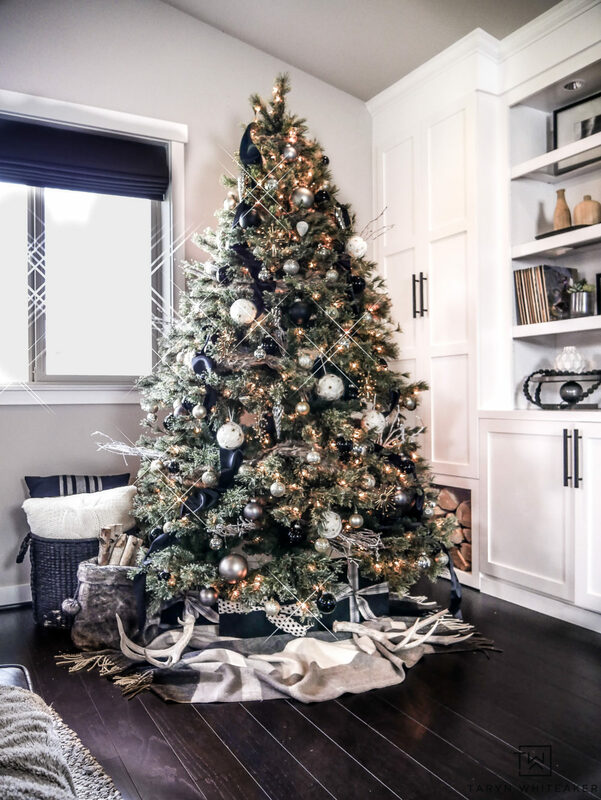 Such a gorgeous, elegant tree! Love all the sparkle! So pretty with the faux fur garland and blanket for a skirt. Your tree is gorgeous and I love the subtle flocking. It’s the best of both worlds. Wow, this is one beautiful tree! Love the moody colors, and it fits so well in your lovely new room! Goodness gracious this is beautiful! I love your color scheme and everything looks modern, yet cozy and welcoming. You incorporated those rustic touches beautifully! Love it all. Thanks for joining in on the fun this year! beautiful tree! Looks glam and chic, and oh so well put together. Happy holidays! 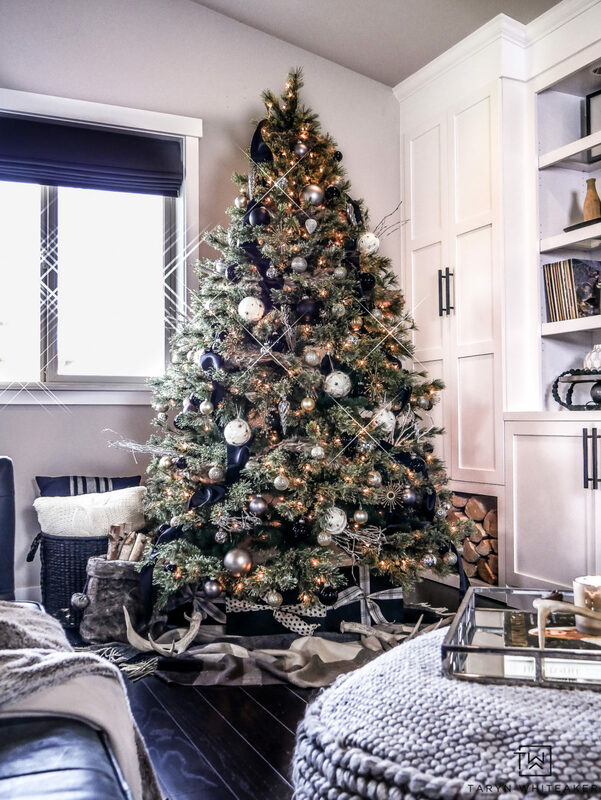 I need you to come photograph my tree, because DAYUM, this is MAGICAL! It looks gorgeous! Oh that is the sweetest thing to say! I have worked so so hard at photographing my trees because they were so terrible for so many years lol! How tall is the tree and how wide is it? Thanks!